I tried to find an explanation for why Google no longer gives information on all the organic search words our clients use to find us. Have you seen all the articles circulating since the start of the year on the death of Google organic keywords? 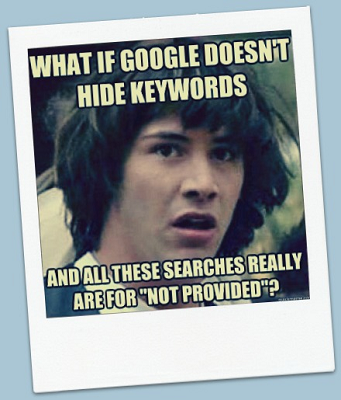 One from Hubspot, written by Hartley Brody, has as a title, Is 2013 the Year Marketers Lose Keyword Research?A company, Resource, announced Empty Analytics: How “Not Provided” Keyword Data Affects SEO. Here’s another one: The rise of (not provided). Is Google making it impossible to measure natural search ? Get the picture? I tried to find a simple explanation for what Google is doing when it lists these lost organic keywords as (not provided) thereby not telling us what keywords a client used. But most of the article writers assumed that the reader knew how this designation for lost organic keywords as (not provided) came to be. The one with the most understandable explanation was the Hubspot blog by Hartley Brody.